coming at ya from Ohio! How was your second hand shopping this week? I got out there once before I left for the week, overcrowded thrift stores since it's 10 days to Halloween, but it wasn't too bad. 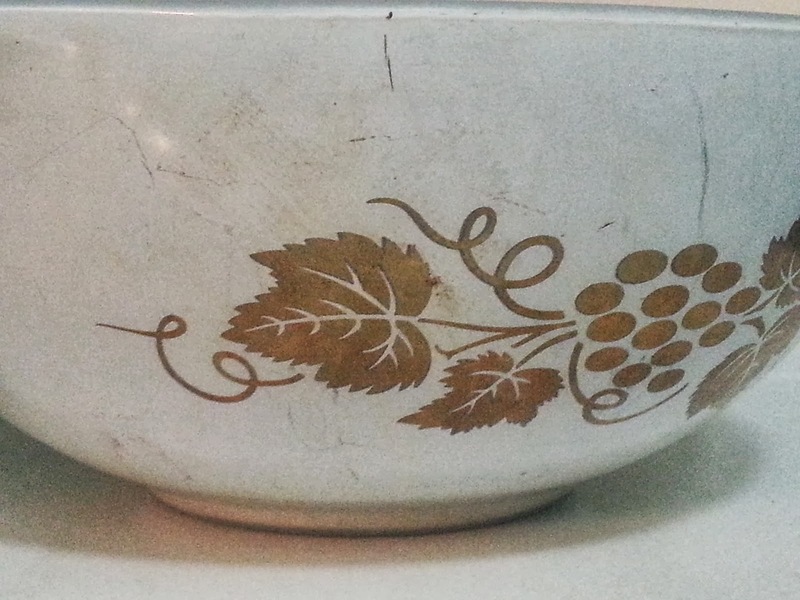 A very nice woman commented on both the bowl & the cookie jar, she actually talked me into buying the cookie jar as I was on the fence about it. It seems like it possibly has a manufacturing defect & has a surface scratch & had many surface scuffs that looked similar to Pyrex utensil marks. I was right about those - easy to get out! 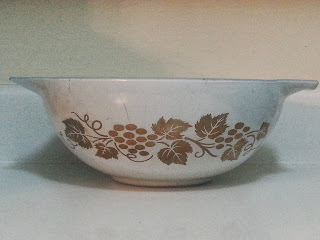 Also found a Hazel Atlas polka dot bowl. Just need one more to complete the set - the blue/turquoise colour one. 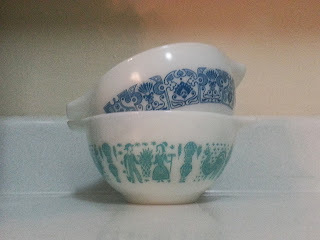 I also found this Lefton Bluebird creamer, chipped, but it was 99cents (ugh, I feel like Macklemore). I filed down some of the chips & he looks a little better. 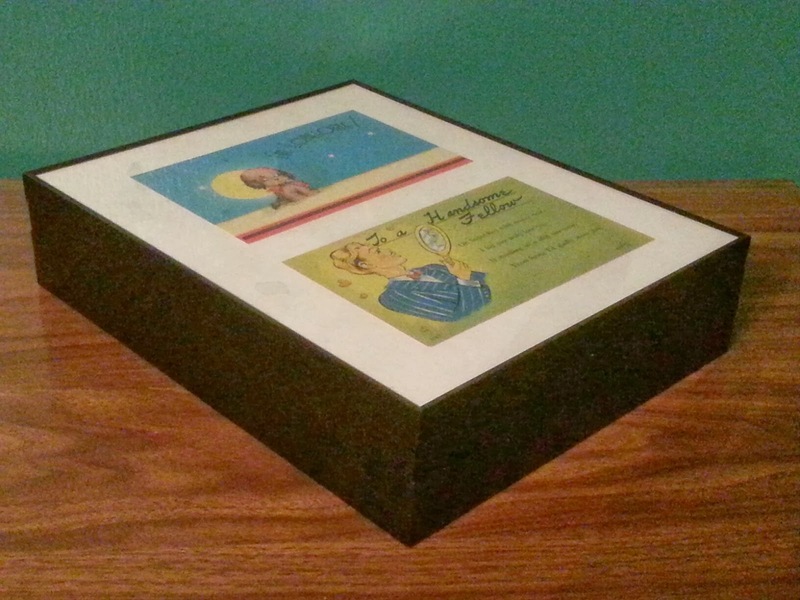 He's a bit crazed, too, but I couldn't let him get tossed & for a buck, he'd look great on a display shelf higher up where no one could tell he's chipped. His chips are in his beak. That's it for me. Hopefully I have some Ohio finds to show. We decided to leave a day early & are going to end up making a couple thrift store stops & were going to go to antique malls on Thursday, however, not anymore. We'll see where the week takes us. Hopefully I can get some stuff in. We had plans to go to several malls, but they all seem scrapped, but things can always change. Thanks for checking out Thriftasaurus this week, hope to see you again soon! An eclectic mix of finds for me this week. 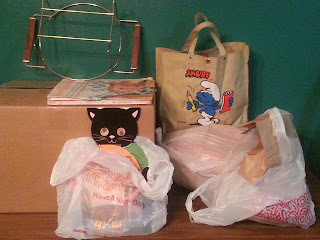 I don't shop at Goodwill much anymore now that the one near my home has closed, but once in awhile - I'm there! 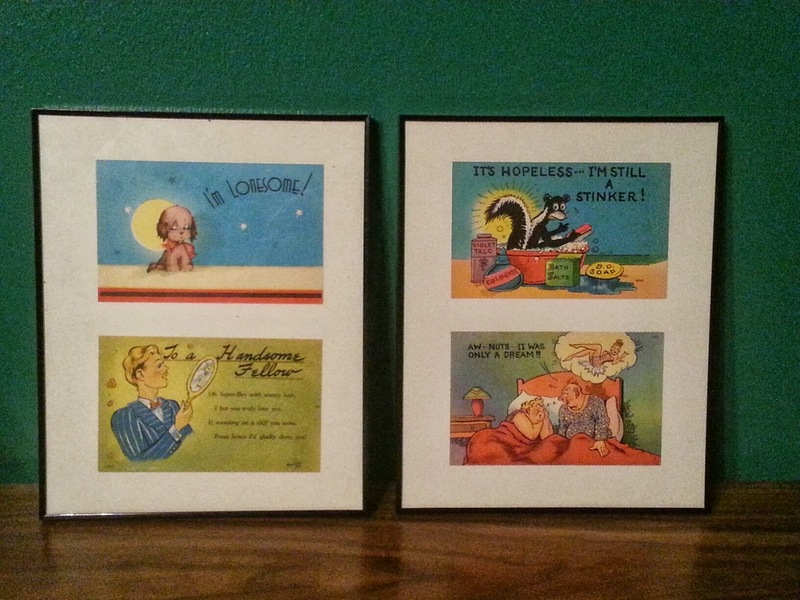 Goodwill finds are few & far between for me, don't understand why, though. This pertains to every Goodwill I visit, which is why I don't waste my time. I was in the area, so stopped in on 50% off kitchenware day... lo & behold, a Friendship 441 & 443 - $4 for both after discount. 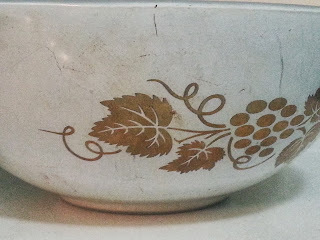 I haven't found Pyrex at Goodwill since winter! 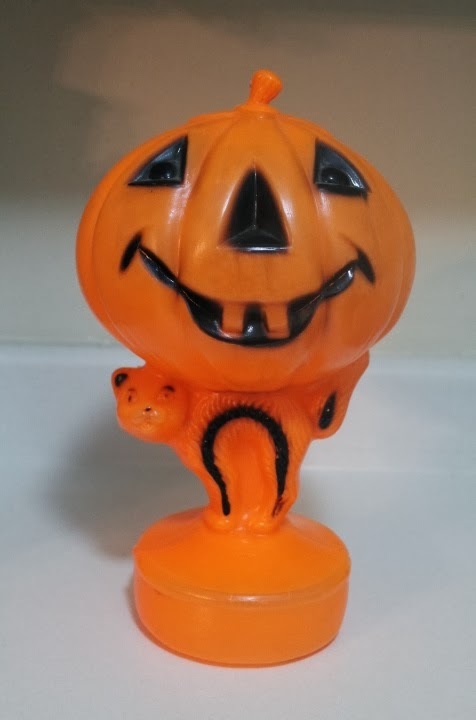 A Halloween blow mold, blow molds aren't something I want to start collecting, but this is something small enough that it will look good on a shelf in my apartment come next Halloween. I have to search for a replacement bulb. I can't decorate this year, my place is too much of a mess. A 1978 Rock Jam Hilroy Beegees binder, the image is under licensed to Hilroy. Cards! Cards! Cards! You can never have enough. Donkey Kong board game. Never knew this existed, cool. I don't know about these guys, but they were created by Russ (the makers of the '90s Trolls), tagged with stickers "1993 The Funmaker Company". I cannot find any information online about them besides someone asking a question about them regarding an eBay auction on a toy collecting forum a few years ago. 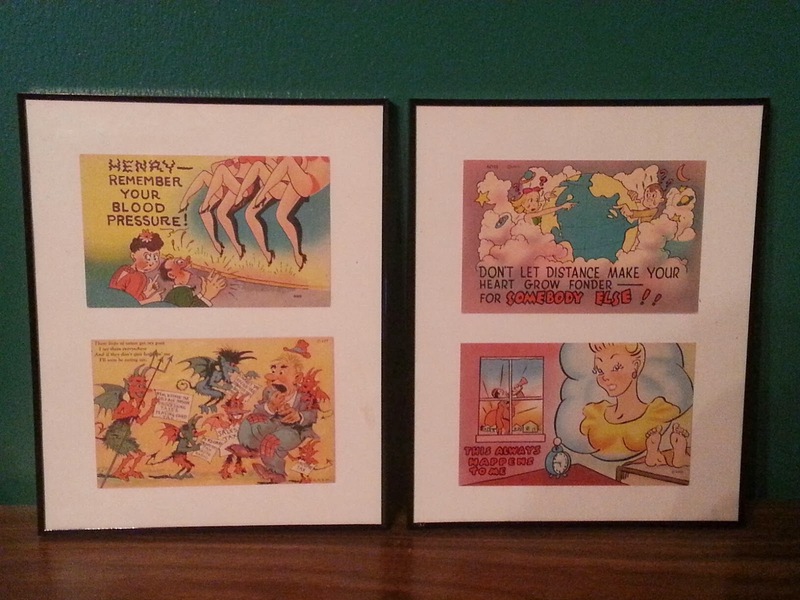 They look Tank Girl inspired, which attracted me to them. Anybody perhaps know anything about them? Next week I won't have time to thrift! Busy bee. Link up below with all your second hand finds. Can't wait to see what you've picked up! 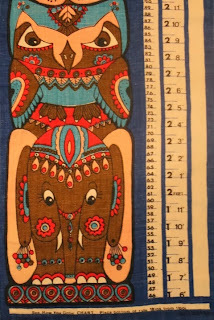 Check out this growth chart, groovy, isn't it? More than I should have paid, but I considered it a very unique item & welcome it warmly into my collection of things (if you're curious - $5.99). A few flocked Santas, you don't see blue everyday, so I really like that. The little soft Santa ornament with the tea light is my favourite Santa find, he's adorable. 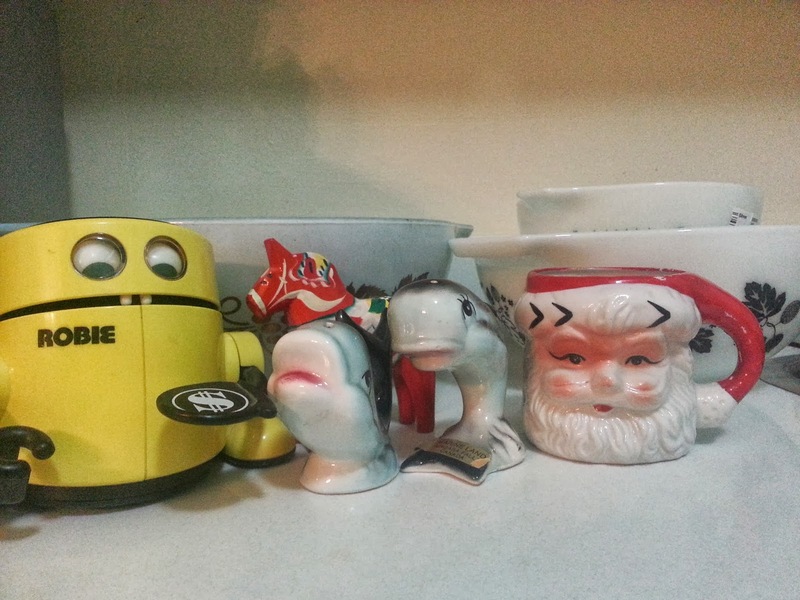 Also, a made in Japan tea light holder, another Santa item! A pack of vintage candles with a tear on the top. Oh well. 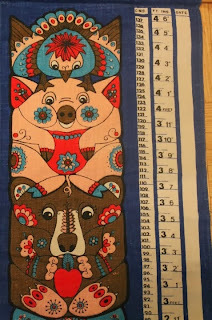 A few months ago, I go some unused made in Switzerland Kreier tea towels & pot holder (or something, I don't know what it's called). 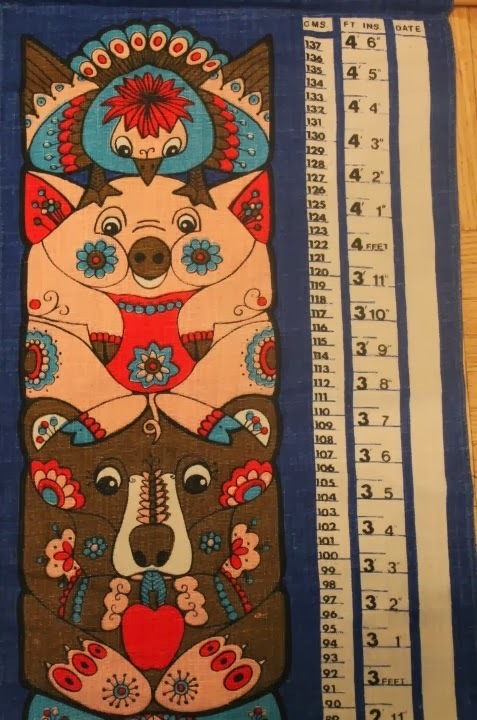 These place mats, I believe, unused. At the thrift store they had a sticker on them, but it's since disappeared. can't wait to see what you've found this week, link up below with Thriftasaurus! Happy Thanksgiving to all who are celebrating this weekend. 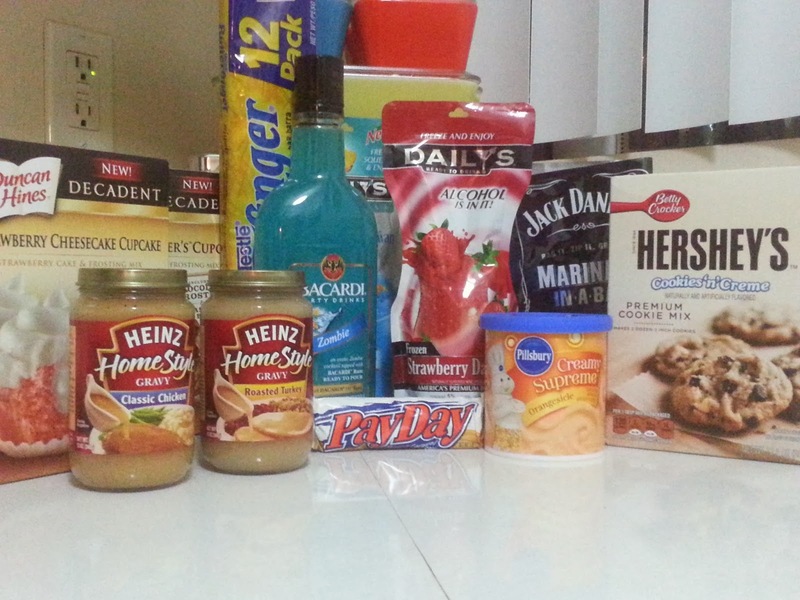 I'll be celebrating at home with my boyfriend & Butterprint. 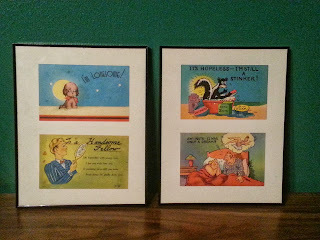 & does anybody know any good antique markets off the I-90 in PA? 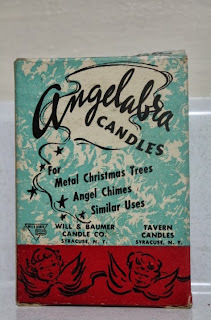 The only one I know about is the Interstate Antique Market. If you are a frequent reader of my blog, do you think I will like it? Hello there! Still here blogging from my phone... didn't get a chance to work on trying to fix my computer (thanks Amy [ from Actsofsalvage.com ] I'll give you a shout when I find out I can't fix it. This past week, between work and meeting people off the net for vintage purchases (seriously... I held vomit for half an hour while putting on a happy, polite, I haven't been sick for almost 4 weeks look) I've spent all my free time in bed, aside from Friday when my boyfriend took me out shopping since I was feeling a bit better and we had planned it for weeks. I don't know what's going on with all this shady stuff, but I don't like it! 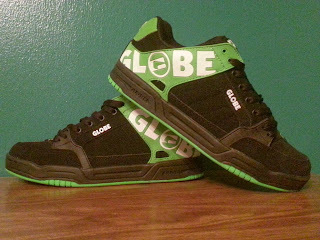 Even my new DC shoes I bought less than a month ago for work are destroyed due to a detiriorated heel liner (looked up ways to fix it... but I am lazy). 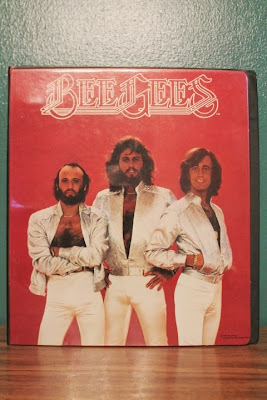 I managed to get in some alright finds that are pure Sir Thrift-A-Lot. Pyrex... it's been a tough find lately, but I got a drizzle. The blue grapes or whatever truly needs some work... and I found the 441 a few months ago. 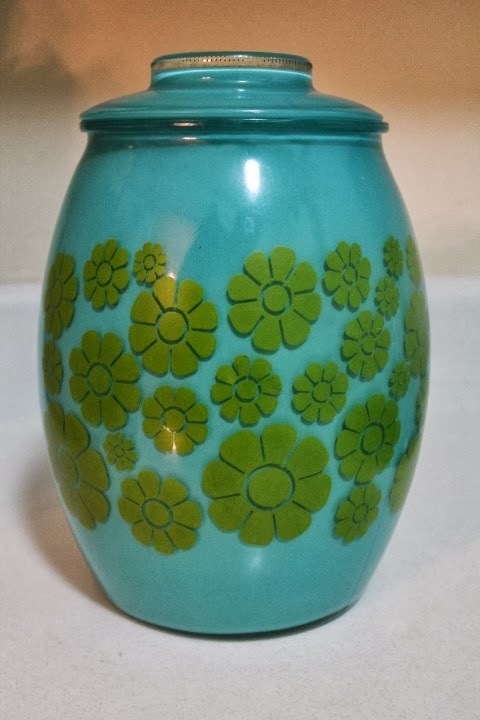 Butterprint is mint and the Horizon Blue was $1.99... I think one of my cheapest Pyrex purchases ever! The 443 was a Kijiji buy, completes my set. I love it. 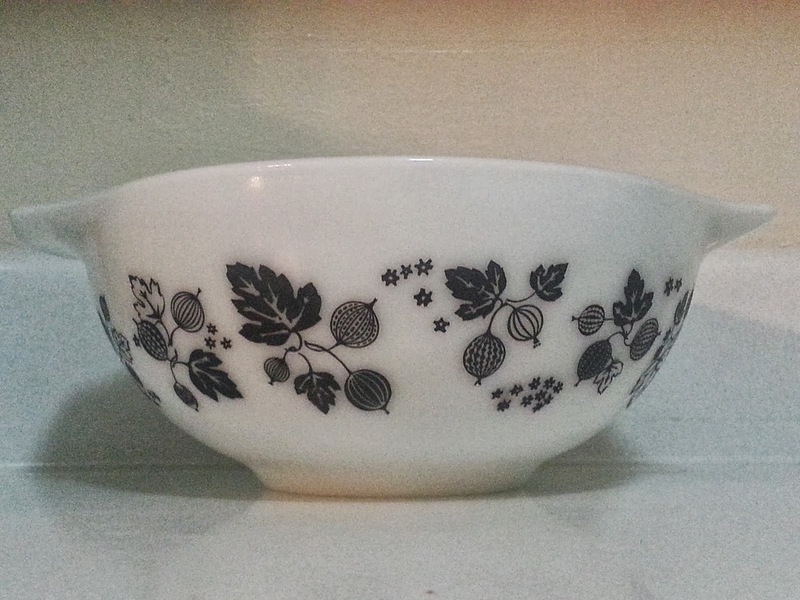 The white.and black Goosebery is a favourite if mine. 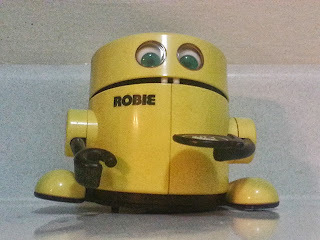 Remember Robie? I owe this find to my boyfriend... I always pass by all the chords and remote controls, this guy was stuffed in one of those bags hanging with all that jazz. Upon shaking him he seemed broken... but when we got him home, there was a key inside and a Canadian flag pin. 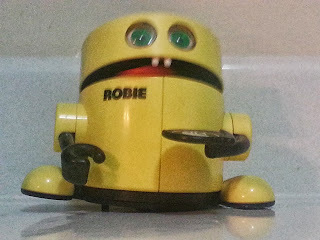 Lucky for me the mercury battery didn't explode and my Robie works! 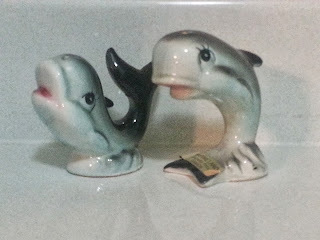 I think I passed this set of $5 shakers up at an antique market a few months ago and after seeing Van on Thrift Core display a vintage whale, guess I was inspired... ya, I know... these are dolphins. Another set of salt and pepper shakers have entered the house! My display case and shelfing for my s&ps is to compacity, so until I find a new solution, gotta keep them off to the side. 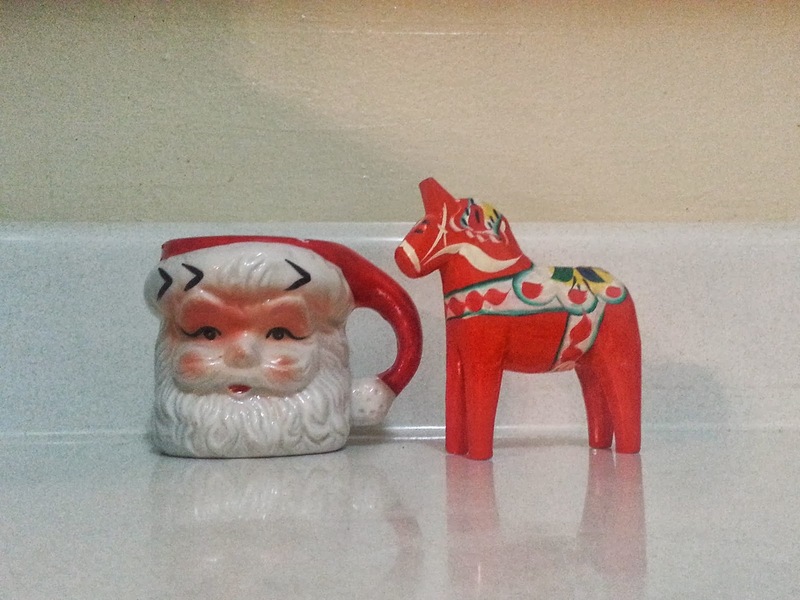 Original Dala horse still with sticker and cute vintage Santa mug unused with original tag. 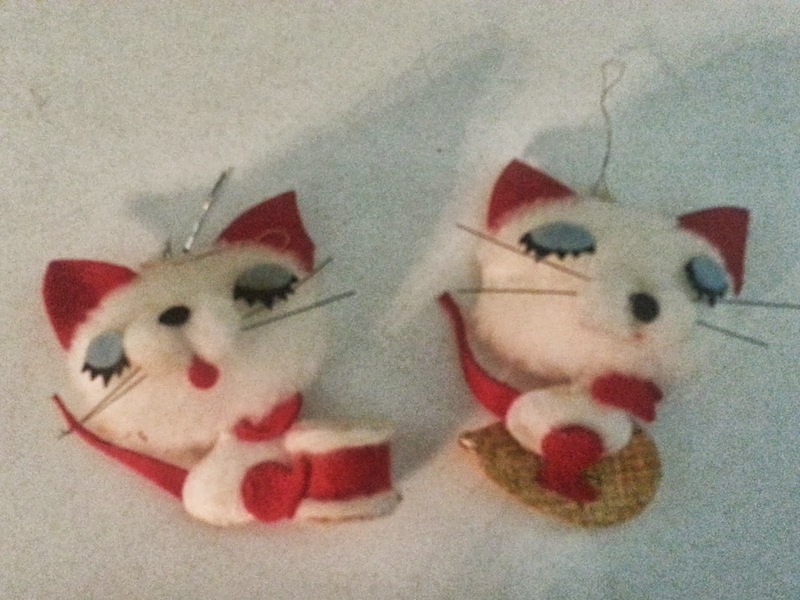 A cute pair of Christmas decorations that I should of posted last week for Thriftasaurus if my computer hadn't died. I'll be featuring the rest of that stuff as time goes by.